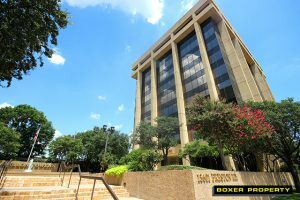 October 24, 2016 (Dallas, TX) – Boxer Property announced today that it has concluded a lease expansion of 2,000 rentable square feet directly with Saenz-Rodriguez & Associates, P.C, bringing the law firm’s total office space to over 5,000 square feet in Carillon Towers, located at 13601 Preston Road in Dallas, TX . The growing firm has nearly doubled its space in less than a year, and the new lease is for a multi-year term. Leasing Representative, Brenda Blake negotiated the lease on behalf of Boxer Property. Saenz-Rodriquez acted as its own agent. Carillon Towers has 10 floors with a total of 261,975 square feet of office space in Dallas . This Class A professional environment offers ample amenities, including reserved garage and surface parking, conference facilities, renovated lobbies, and updated common areas. Professionally managed building has onsite leasing, maintenance, and property management and includes a courtesy guard and 24-hour secure key card access. Tenants also enjoy an on-site fitness center with sauna, digital touch screen directory kiosk, vending machines, and the Carillon Café in addition to easy access to many nearby retail shops and restaurants. A bus stop is conveniently located right in front of the complex. Saenz-Rodriguez & Associates is led by attorneys Michelle L. Saenz-Rodriguez and George Rodriguez, a husband and wife team. Their law offices located in Dallas, serve clients in the Dallas metroplex and throughout the state, as well as nationwide and abroad. The practice focuses on all areas of immigration law, including citizenship, naturalization, family-based immigration, employment-based immigration, waivers, green card applications, immigrant bond hearings, political asylum and deportation/removal defense.